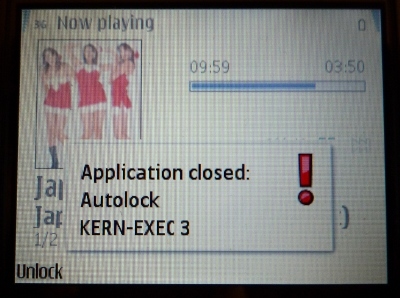 So I wanted to use my Nokia E71 for something, but first had to try dismissing this dialog, but of course first I would have needed to remove the keylock, but hey, it was the keylock controlling application that had crashed. Written on Monday, April 27, 2009 by Tero Hasu. Tagged as fun, S60, Symbian.